Coral reefs are not only beautiful, but vital to the marine ecosystems. They act as a buffer, protecting coastal communities from waves and storm surges, and boost local economies through the seafood they harbour and the tourists they attract. But there are fears that ocean acidification caused by carbon dioxide, the main greenhouse gas, is putting these delicate organisms in serious danger. The threat to coral reefs inspired Nell Bennett, a graduate of the Royal College of Art in London, to design a product that could reduce the acidity of the water around the coral. “Oceans are becoming more acidic. Any coral skeleton that is exposed is becoming dissolved by the increasing acidity. It’s a bit like your teeth: if you were to drink something sugary and acidic then it starts to attack the exposed part of your tooth. And this is what’s happening with corals. And that happens and makes the corals very weak and then they crumble and die,” she explained. 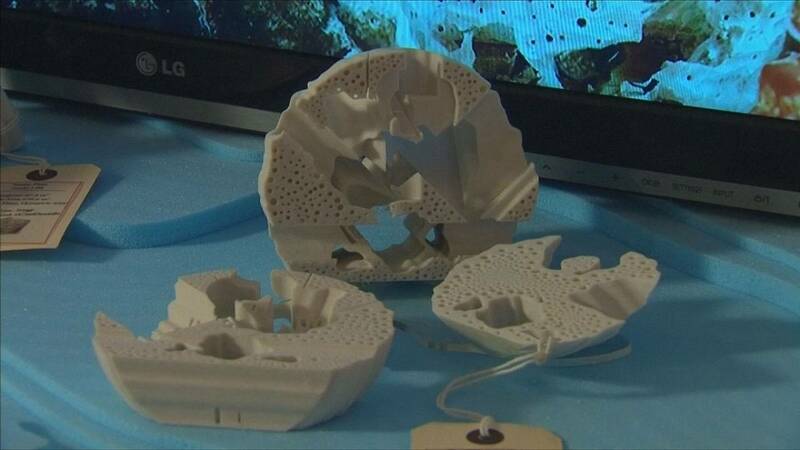 Bennett came up a with novel solution: an artificial coral, made from mineral-rich alkaline materials – including calcium carbonate and sodium carbonate. When placed in a coral reef, the artificial coral slowly dissolves with the ocean current and acidity in the water, bathing the adjacent reef in alkaline water, to counteract the acidity. The pace of ocean acidification is growing alarmingly fast according to some experts, who are warning that by 2050, all of the Earth’s coral reefs could be endangered both by human activity and climate change.